For at least as long as I have been a part of it, the Power Transmission Distributors Association has seen no shortage of manufacturers anxious and interested in joining. However, what has been missing, both in manufacturing applicants and a surprising number of current manufacturing members, is universal manufacturer excitement in recognizing their distribution partners online. It was this lack of enthusiasm, particularly among current PTDA member manufacturers, that inspired me to write an article titled "Partners, Opportunists, & Competitors: Why It's Time to Start Caring About Supplier Websites" in the January/February edition of Industrial Distribution magazine. Taking the article one step further, I wanted to quantify the issue/opportunity for the greater benefit of the members of PTDA, not to name and shame, but rather to foster awareness and hopefully jump-start conversations that will lead to renewed trust and stronger relationships. It is obvious to me that there exists a significant number of underlying trust issues, and addressing this opportunity falls not just on one company or one set of companies but the entire association working together. I see it as incumbent on each PTDA member to develop ideas and concepts that will preserve and enhance future trust between distributors and their suppliers in ways that will allow each to recognize and celebrate the other to product end users... be it online, over the phone, or in a print catalog. How Did You Quantify the Issue? I manually visiting the webpage of every one of the 193 PTDA member manufacturers currently listed on the PTDA website (as of February 15, 2015), reviewed each site's content, and, based on what I found, placed each website into one of three broad buckets: "Partners", "Opportunists", or "Competitors". Website Partners - If I could find a "Find a Distributor" tool or a list of distributors on a manufacturer's website AND I could not find evidence of open direct sales (a web store with pricing and a shopping cart that does not requiring a log-in to check out)... I recorded the company as a "Partner". Website Opportunists - If I could find no evidence of either a "Find a Distributor" tool or list AND no evidence of open selling on the site, I categorized the company under the broad "Opportunist" bucket. (Note: I recognize every for-profit business is technically an "opportunist", so perhaps I could have come up with a better name such as "non-collaborator"... but this was the original term I used in the article so I've stuck with it for consistency.) Bottom line, these are PTDA manufacturers that, for whatever reason, do not highlight individual distribution partners on their website. Website Competitors - Lastly, if I found evidence that the manufacturer was openly selling direct (without requiring a log-in) on their website, I categorized the company as a "Competitor". Starting with the good, of the 193 listed manufacturer companies, 60 companies had a "Find a Distributor" tool, and a further 12 offered a list of distributors. These companies tended to be the mid-sized to larger companies (though there certainly were plenty of exceptions). The number of PTDA "Partner" manufacturers is also slightly inflated, as some large manufacturers have several individual member subsidiaries included in the PTDA list of 193 manufacturers, and fell into this bucket several times. For more than half of all PTDA member manufacturers, I could not find any evidence (at least from their homepage) of any list or tool recognizing the distributors they work with or prefer. Many of these manufacturers did have the PTDA badge on their website (some of which did have a live link back to the PTDA website)... but these sites appeared geared primarily to getting end users excited about their products and "Request a Quote Now" appeared to be the primary call to action on these sites. Of the 109, they fell all over the spectrum... with some leaning both dangerously close to "Competitors" and others apparently fairly supportive of distribution (despite not listing any recommended distributors). Within the 109 websites, it is certain that I missed seeing something... and that at least a few of these should have been categorizes as either a "Supporter" or "Competitor". However, even given these adjustments... I would expect the overall result/conclusion remains the same: More than half of all PTDA member manufacturer members are currently not recognizing any individual distributors on their website. Given my limited search, I found that at least 12 PTDA member manufacturers were selling on their website direct... and I say "at least" because I often did not find out that the manufacturer was selling direct until I searched for and found a product several pages into their website (meaning it's entirely possible that I missed a few others who are also selling direct). 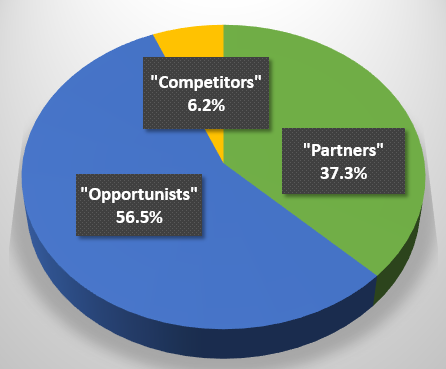 Of the 12, 8 had no reference tool or list of distribution partners... but, surprisingly 4 did (giving "Competitors" about the same percentage of "Find a Distributor" participation as non-open selling manufacturers). Three of these direct sales manufacturers offered a "Find a Distributor" tool, while the fourth provided a list. And Why Does All This Matter Again? Lovejoy is like many other leading mechanical power transmission companies, a single digit growth company. 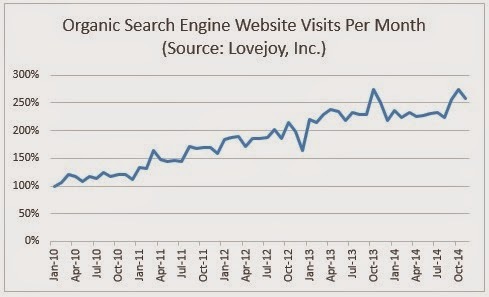 However, as more and more end users turning to finding solutions online, Lovejoy's organic web-traffic has far exceeded sales... growing by over 250% in the last 5 years. This is not only a Lovejoy trend, but a worldwide trend... and one that shows no sign of slowing. As such, it is more critical now than ever that those who support the distribution sales model clearly and consistently communicate this to our user base (who are increasingly engaging with us online).... but currently this isn't happening with more than half of PTDA's manufacturing members. Only about one-third of PTDA's manufacturing members are actively helping connect their website visitors to their preferred distribution partners. As an association, how does PTDA respond to this trend? What best practices and tools can PTDA member manufacturers (many who support distribution but may be scared of losing business by promoting distribution on their website) be equipped with that will both better show support to distribution and minimize risk that website visitors end up buying a competitor product? Among the 72 current "Partner" manufacturers, I found several fantastic "Find a Distributor" tools. Some were quite innovative and may go some way towards encouraging additional manufacturers to add a tool... so I will look to add a few of those to this blog in the coming days... but this is certainly not an issue that just a few people can solve in isolation. If you have any thoughts, ideas, or feedback on how PTDA as an organization can encourage and support manufacturers to recognize their distributor partners online (especially if you are one of the many manufacturers currently not doing so)... please share those either in the comments section on this blog post below (starting what will hopefully be a healthy public dialogue) and/or send me a private message on LinkedIn. My hope is that, given enough awareness and dialogue, answers will be found.... and distributors and their supplier partners will have stronger and richer relationships.